Saturdays. Ah, a day to relax and not worry about any schedule. No need to rush off anywhere (most times), no emergencies. Just taking a day to be together as a family and spend moments with each other. 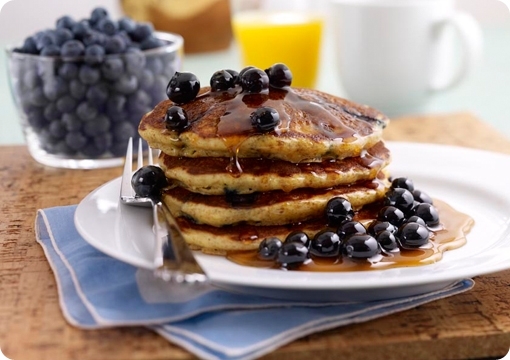 Days like today beckon for delicious breakfasts, like pancakes. I am still tweaking our sprouted wheat/spelt recipe. It would help if I actually wrote my measurements down. I am not one for exactness when it comes to a recipe. Nonetheless, here is what I have so far, though I am sure it will need some more experimenting. Set to “Grind Grain” and completely pulverize the sprouts and nuts. Blend until batter looks smooth. It may take these a little while longer to cook through. I usually use my stainless steel electrical skillet with the lid. Then keep them warm in the oven as I go. Top off a stack with some real butter (preferably from grass-fed cows) and 100% maple syrup Grade B (“B” is better – has less processing and maintains more nutrients then A). I also like some fresh molasses, sorghum syrup, or berries mixed with raw honey. Previous postPizza and Scriptures, Anyone? We are making these this AM…I should wait to post until AFTER we eat them – but I am excited as this is my first time using my wet sprouted wheat berries in a recipe. We had to make a few modifications since we don’t have coconut milk or flour. Is this the recipe you used when we had breakfast at your place? I also love Saturday AM breakfast – more time to experiment! Yes, they are 🙂 Let me know how they turn out!